He was born in Atmora under the name Talos, meaning Stormcrown in the old Ehlnofey. He spent his youth in Skyrim, where he learned the ancient art of the Tongues as well as the strategies of war from the chieftains there. At the age of 20, he led the invasion of Old Hrol'dan, taking it back from the Witchmen of High Rock, his earliest known military victory. Soon after, growing storms made it known that the Greybeards were about to speak. As nearby villages were being evacuated, Talos traveled up the mountains the Greybeards called home, where they removed their gags and spoke his name, causing the world to shake. The Greybeards told Talos that he would come to rule Tamriel, but he must go south to do so. Before he left, he learned the secrets of the high peak winds—the roar of the winter blast, and the warm silk of the summer updrafts. When he descended from the mountains, he came riding the clouds, striding through the air in great boots he claimed were gifts of the Greybeards for his cunning craft and riddling. Talos became General of the Colovian Estates under King (and later Emperor) Cuhlecain. General Talos met the combined army of Skyrim and High Rock on the field of Sancre Tor, who were hostile to Cuhlecain. The Skyrim army joined him when they saw him use the thu'um and knew him to be the son of Skyrim and heir to the Empires of Men. But the Bretons saw things differently. The general was almost killed in 2E 854 by a High Rock nightblade who managed to slit his throat and kill Emperor Cuhlecain. Although he could no longer use the Voice, he went on to command Tamriel with a whisper. He took the Cyrodilic name Tiber Septim, as well as "Ysmir, the Dragon of the North", the Nordic Name of Kings (also called more simply "Ysmir, Dragon of the North"). Tiber Septim died in 3E 38. Hjalti Early-Beard was born on the island of Alcaire, in High Rock. Amid rumors of a warlord destined to rule Tamriel, he rose to prominence in the service of King Cuhlecain and fought to unify Cyrodiil. Few knew of the existence of his secret ally, the Underking, Ysmir Kingmaker. The Underking provided assistance to the young General, but the manner of his assistance is vaguely described in the book. There are references to a storm that talks all night with Hjalti and deflected arrows while Hjalti shouted down the wall of Old Hrol'dan, where Hjalti was given the name Talos, meaning Stormcrown, by his men. This storm is most likely the Underking, as his body had recently been blasted to ash by the Greybeards, and he is referred to as Ysmir, the Grey Wind and the Storm of Kyne. After the province was conquered, Hjalti murdered Cuhlecain and his contingent in the Imperial City and blamed the deaths and ensuing blaze on assassins from High Rock. The Underking continued to aid in his conquests, and Hjalti took the name Tiber Septim, ascending to the Ruby Throne. Whether or not this version of events is accurate, it is known that prior to the events of the Warp in the West, the 24th of Mid Year was a holiday in Alcaire known as Tibedetha—middle Tamrielic for "Tiber's Day." The Lorddom celebrated its most famous native with a great party, though historically, Tiber Septim never returned to his beloved birthplace. It is not known if Tibedetha continued to be celebrated after the Warp. He was believed to have been born in 2E 828 in the ancient continent of Atmora, according to the official story. Tiber is believed to have also been of Nordic blood. The identity of his parents is not recorded. The details of his youth are not well-known, despite the fact he spent it in Skyrim. Tiber Septim had one child with an unknown woman, and this child in turn had one son—Pelagius. Some sources claimed, in apparent error, that Pelagius was Tiber Septim's eldest son. Late in life, according to other sources, he had an affair with the future Dunmeri Queen, Barenziah, and had her unborn child aborted. His reign lasted from 2E 854 until his death in 3E 38, lasting for 81 years. Tiber Septim became associated with several notable artifacts during his lifetime (and, in some cases, beyond). 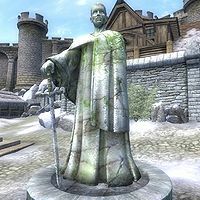 The Totem of Tiber Septim is a powerful but mysterious artifact that can be used by persons of royal blood to control Numidium, a powerful golem that helped Tiber Septim conquer Tamriel. It is believed to have played a crucial role in the Warp in the West. According to stories out of Morrowind, Tiber Septim appeared to the Nerevarine just before his reconquest of Red Mountain. He was an old man named Wulf that no others could see, and he gave the hero one of his own septims and granted him luck. The levitating Boots of the Apostle are attributed to the Emperor, though they remain veiled in mystery. There is some suggestion that the Nerevarine may also have found them. The Armor of Tiber Septim was recovered from a ruined fort in Cyrodiil for use by Martin Septim in his effort to stop the Oblivion Crisis. In the Skyrim quest The Ghost of Old Hroldan, an ancient ghost repeatedly refers to the defeater of the Witchmen of High Rock as Hjalti, and makes reference to the time they spent together learning from "the sword masters of Alcaire".